Brides Les Bains is a commune in the department of Savoy in the Rhône-Alpes region in the southeast of France. It's a nice resort town, created in 1848 on thermal springs and has long been known for its clinic for the therapy of obesity and healing procedures based on mineral water. Brides Les Bains is located at an altitude of 600 meters, but, according to many doctors, it is at such heights that the human body does not experience excessive stress from the pressure drop, as in the highlands. Here, in the resort on the mineral waters, life is going on for leisurely and quiet rest. And if active skiing is supplemented by a visit to the spa, a massage course, mud cure and a pool with thermal water, then such a holiday can be considered complete. Excellent infrastructure and relatively inexpensive service prices have made Brides Les Bains one of the most popular accommodation spots resort in the Three Valleys. The first hotels appeared in Brides Les Bains in 1824, and from 1825 the resort began to specialize in the treatment of the overweight. And in the 1950s skiing also came here. The infrastructure for skiing has appeared in Brides Les Bains relatively recently: in 1992 during the Olympic Winter Games Games in Albertville, the resort was chosen as one of the Olympic villages. The successful location of the resort has made Brides Les Bains a part of the biggest common ski area of the Three Valleys. In Alps2Alps we use a dynamic and mostly flexible pricing system, in order to keep costs for our customers as low as possible. According to all the details of your trip, we can offer you the best possible price quote for your group, whatever time of year you travel to Brides Les Bains. Alps2Alps promises to get you to Brides Les Bains in comfort, with maximum reliability, and at the lowest possible price. All of the above factors will only result in our base-rate for ski transfers going down – we never overstate our prices at any time or for any reason. We also offer big discounts for off-peak and midweek transfers to the ski resorts. If you are looking for the best deals, get to know that traveling outside high season or in midweek leads to the biggest savings. We offer transfer services on working days (from Monday to Friday) with up to 60% discount than weekend prices. Your transfer quote will also depend on vehicle availability, transfer schedule, vehicle utilization and other costs (road tolls, airport parking charges). If you have any specific requirements or going to travel in a large group, please get in touch directly so we can discuss all details of your transfer. 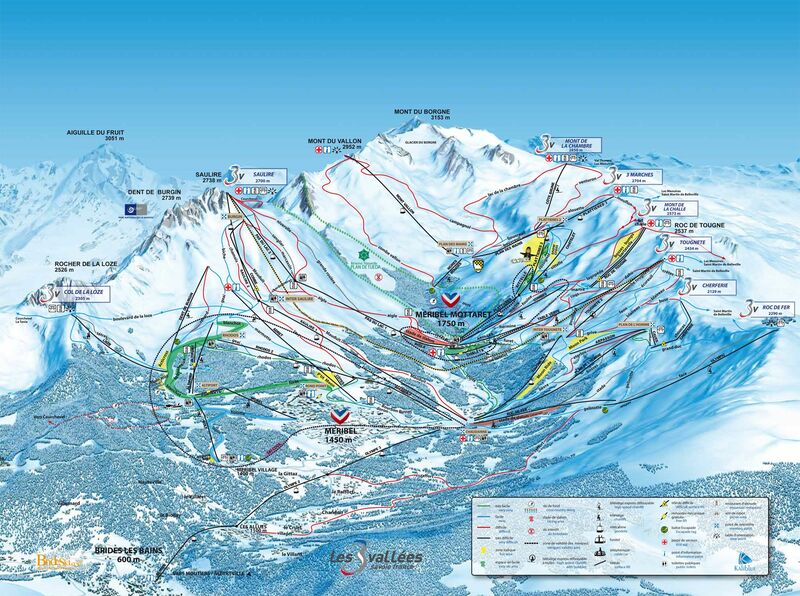 25 minutes on ski-lift from Brides Les Bains to Meribel and a further way to the entire ski area of Three Valleys (Meribel, Meribel Mottaret, Courchevel, Les Menuires, and Val Thorens) is open. Because of the relatively easy access to one of the most prestigious ski areas, many choose an inexpensive, but very nice Brides Les Bains. All ski resorts of Three Valleys are good for everyone-families with little kids, groups of tourists, professional sportsmen for training or participants in the Alpine skiing competition, in this huge ski area each guest will be provided from December to April with reliable snow slopes, numerous hotels, and a magnificent tourist infrastructure. As Brides Les Bains is the part of this 600km playground, you can be guaranteed to enjoy all the opportunities of this ski region. If you are planning to spend your holiday in Brides Les Bains, let it start with a little help from Alps2Alps. We’re proud to offer you the most reliable and affordable transfer to this Alpine ski resort, all throughout the season and, besides, at the very attractive price. Start enjoying your holiday the moment you step on our board! Everything is quite simple. If you want to get the best possible deal on your transfer to and from Brides Les Bains, be sure to book it in advance. Or if you can’t find the service or destination you’re looking for on our website, just call Alps2Alps customer service team and they will give you this missing information. If you want to get to the place of your memorable holiday on time and in comfort, you can count on us! You are always welcome in Alps2Alps.